If anyone is as bored as me , i will be heading out near Shooter Hill , oberon and surrounds on thursday afternoon to have crack at some snow. looks like 5pm or so into evening for snowfalls. Nick spoke to me just after 3pm and suggested he was observing snow on the ground but patchy on the way to Oberon - which is at 1100 metres above sea level. He is awaiting some moisture injection but it seems the main front may already be through. There is the central part of the low coming through later. He'll report his findings when he is back. Here is the main front passing through western syd heading east. Scattered lightning and 5mm hail. I could not take any photos as I was at work however it was the first thunderstorm I have experienced since April 13 this year being 115 days between thunderstorms. For August this storm displayed some reasonable cloud structure at times as it passed over Auburn where I work. I was watching the lightning tracker and counted some 72 lightning flashes over or near Sydney and environs as it passed over between 2 and 3 pm. Until 5.15 it appears that 137 flashes had occurred with the most common being Negative CG flashes (71 flashes in total). 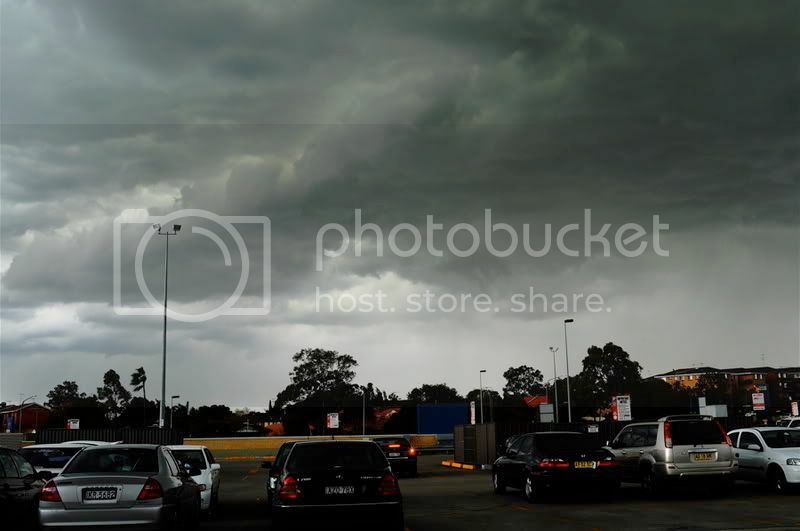 The most active period and the most active storms were around Sydney between the period of 1 to 3 pm then waning afterwards, particularly as the storm cells crossed the coast and weakened. There was little rainfall where I live being 0.5 mm and 1 mm at Auburn. Some places south of Auburn such as Bankstown scored 5.6 mm, Homebush Bay 3.6 mm and Granville 4 mm but most other falls were in the 1 to 3 mm range throughout western Sydney. The highest total was 11 mm at Chatswood and 4.4 mm at Observatory Hill. It is noted that 7 mm fell at La Peruse in Sydney's east. was unfortunetly carless at the time but got a few snaps while hangin around. Great photos. Looks like some half decent instability in the latter pics, there's plenty of motion underneath the storm. Did the storm produce any hail?